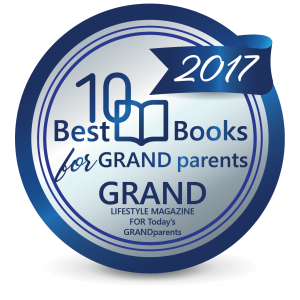 There are so many good books today to help us on this extraordinary grandparent journey, it’s almost impossible to boil them down to just ten, but we did our best and here are the 2017 GRAND picks. For a nice change, a book for grandparents with an image of a contemporary GRANDmom on the cover. This book is a creative collection of fun activities to help grandparents, especially us non-crafty ones, spend quality time with the g-kids and not break the bank. It has easy-to-follow instructions for about 40 crafts, baking, and games that are sure to create special memories. Link for free access to GRAND - www.grandsub.com. Disclosure: I got this in a Goodreads Giveaway, but no one paid me to review it. I entered the drawing because I wanted it! So I was really excited to win and get it. My review is independent and no one is happier than I am that it is fantastic! This book is just adorable. OK, so I know it's written for grandparents, and I'm not one nor am likely to be for years. But I do have nieces and nephews and great-nieces and nephews of various ages, and more importantly I have a son who is entering babysitting age! And friends, this is awesome for budding babysitting entrepreneurs. First and foremost, the book opens to lie flat and the pages are wipe-clean. If you have ever even met a kid, you know how important this is. If the book doesn't lie flat, you can lose your place mid-project with glue or egg on your hands -ew! And if it doesn't wipe clean, then, well, you're doomed when the kid lowers the running mixer into the stuff to mix instead of putting it in and then turning it on. The publishers have made sure that this is a practical book, and I'm grateful. It opens with a list of supplies to always have on hand. This is an easy package to put together for a babysitting kit - it will fit into any backpack. For home use, it would be simplicity to put into a pretty basket to have around the house and grab out when needed. In addition to the basic supplies, listed along the right-hand page, it also details other fun things to have in the kit. Then it talks about having a dress-up box. I think this is an activity that has gone a lot by the wayside nowadays, judging from what I'm seeing of kids, but here is some guidance for how to start a box if you don't know. The rest of the book is divided into five sections: Creative stuff, kitchen stuff, games, quick and easy, and chilling out. While the pictures and some of the games are oriented toward younger children, there's enough to keep older kids happy. Recipes are given in both imperial and metric units, so conversions aren't necessary. My overwhelming feeling looking at these games was "Why didn't I think of that? I know these things!" But the thing is, when you have a small person standing in front of you and you're responsible for them for a few hours, it's hard to come up with games on the fly. This is a great thing to look through with kids and let them pick out what they want to do. I gave this to my son to inspire him. I hope it inspires you or your budding babysitters as well! Five of five stars. Grandparents play a crucial role in the structure of the family unit, nurturing, educating and provide economical relief for a financially struggling parents. Today’s parents in the U.S. become grandparents at the age of 48. Grandparents today are very active, working and travelling and they have the financial resources to do it all. They are the baby boomers who the world has catered to their whole life. As this age group ages there are more grandparents than ever looking for resources to entertain those grandbabies. The authors have written a book; Granny Get Your Glue Gun, aimed to help grandparents play a more creative role in their grandchildren’s lives. Vibrant photos complement the crafts, baking, games and ‘quick ‘n easy’ sections. As well, there are relaxation suggestions for weary grandparents. Granny Get Your Glue Gun is designed with easy-to-read, clear font, a lay flat binding and comical quotes to keep everyone amused. Everything is aimed at not breaking the grandparent or the bank. The bond between children and their grandparents is so special and needs to be nurtured. Children need their grandparents active and involved in their lives! They have so much to teach them, not to mention shower them with love and showing them that they are safe and protected. Grandparents are now more involved more than ever and this is amazing! Some might be wondering but what do I do with my grandchild when they come to visit? While trips, eating out and shopping are fun, it is not sustainable. Grandparents can’t be breaking the bank every time grandkids come over! Enter: Granny Get Your Glue Gun – the ultimate guide for grandparents on activities to play with their grandkids, crafts and games all around the house. Some of the activities fall under crafts, working in the kitchen, games and there is even a quick n’ easy section. The book is colour coordinated on the outer edge to help you quickly find the page that you are looking for. Each activity has an age appropriate level and roughly the amount of time that it will require you to complete the craft, etc.. Each activity comes with a complete supply list, helpful tips and step by step instructions. It also includes a full-page photo of the completed activity. From the craft section, my favourite craft had to be the personalized place mat! It is a great keepsake for after your grandchild grows out of it or you can even place it into a frame as a special memory keepsake. We know children love to bake and cook but it can sometimes be messy! I loved the helpful recipes that were included that are extremely kid friendly and that you know children will love (ice cream cone cupcakes – count me in!). This is the perfect gift for Grandparents (and even parents – I learned so many new activities and crafts that I tried out with my kids!). It would make an excellent gift for your parents as they embark on a new and exciting stage of their lives as Grandparents! You can purchase copies of the book on Amazon, Amazon Canada, Indigo, website and at local bookstores (for a complete list of locations, visit here). 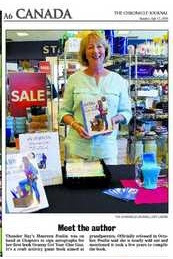 Self-published authors Maureen Goulet and Diana Budden have overcome the challenge of keeping grandchildren entertained. Vancouver authors Goulet and Budden have come to the rescue with a collection of fun activities that “even the most craft-challenged” can enjoy. 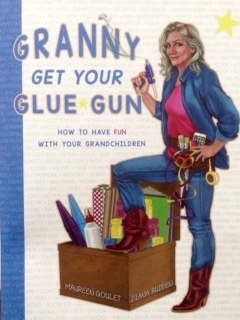 The 64-page entertainment book entitled Granny Get Your Glue Gun was designed with easy-to-follow instructions for about 40 crafts, baking, games and creative activities for both grandparents and grandchildren to enjoy. 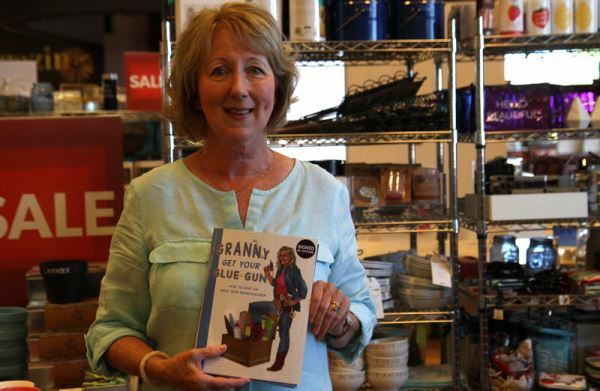 “It’s aimed at the grandparent market,” said Goulet Saturday morning during her book signing at Chapters bookstore in Thunder Bay. Goulet added that people are living longer, grandparents are more mobile and they’re spending more time with their grandchildren. The activities and crafts throughout the book are simple and easy to follow, a comical quote is printed on each page to keep the grandparent amused while entertaining kids ages two to 12. There’s a keep sake section at the front of the book where grandparents can put notes, and at the back there’s a page where they can write down cute things their grandchildren say. Goulet and Budden took a lot of the ideas from their childhood hoping that people will remember these activities from when they were young. “A lot of kids are having children much later in life and the time you get to spent with your grandchildren is even shorter than it used to be,” Goulet said.
" I want to let you know how much I'm enjoying your book. I bought 4 at Red Horses and gave 3 away as gifts. Just today,one friend told me how all her friends were raving about it. We all especially liked the photos and easy instructions, and the fact that pretty much all the materials/ingredients are easily attainable. I have young moms tell me that they're super excited about your book too. I told them to go online and order some, as they're well worth the price. (Pictures and quality are bar none.) So thanks for making me look like a rock star!!" Cell: 604 364-7891 Like Us On Face Book!